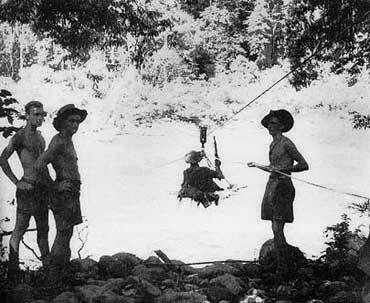 About 50 kilometres from the northern Papuan coast, the track to Kokoda met the Kumusi River at a location known as Wairopi. 100 metres wide, four metres deep and flowing at eight knots, the Kumusi River flowed northwards out of the Owen Stanley Ranges and reached the Solomon Sea 25 kilometres to the north of Gona. At Wairopi, which drew its name from the pidgin rendering of wire rope, there was a bridge suspended by steel cables across the Kumusi River. After the Japanese landed at Buna and Gona they advanced rapidly across the jungle-covered plains towards Wairopi, being contacted briefly by elements of the Papuan Infantry Battalion, under Major W.T. Watson, and a platoon of the 39th Infantry Battalion. On 24 July these forces withdrew across the bridge which they destroyed behind them. 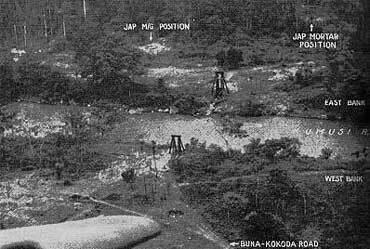 The Japanese however, soon rebuilt the bridge and it was a focal point on their supply line as they advanced over the Kokoda Track during August. The Japanese suspension bridge became a key target of the Allied Air Forces, with the first attack being mounted by Airacobras on 1 August 1942. Located in a deep valley the attack required great flying skill and accuracy. The official air historian wrote: “As attack after attack was made the bridge would sometimes be damaged and the movement of enemy supplies hindered, but the Japanese repaired it as assiduously as spiders repairing cobwebs”. RAAF Kittyhawks and US Flying Fortresses attacked the bridge without success until Mitchell medium bombers mounted 19 sorties, the last of which was successful on 18 October. Between 20 September and 20 October Allied aircraft mounted 80 sorties against the bridge and dropped 76,000 pounds of bombs as well as firing 28,000 rounds of cannon and machine-gun ammunition. The destruction of the bridge contributed to the Japanese supply difficulties as the Australians advanced back over the mountains during October. 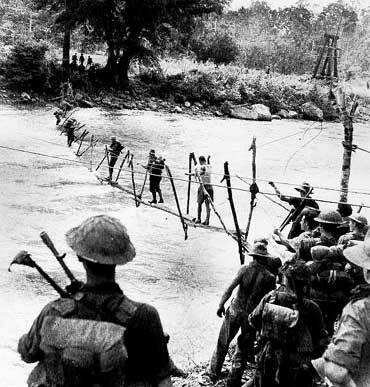 In the Australian counter offensive the 7th Division drove the Japanese defenders back to the Kumusi River where some crossed on boats and others took to rafts in an attempt to float down to the river mouth. In this process the Japanese commander, Major General Horii was drowned. Troops of the 2/31st and 3rd Battalion Militia reached the Kumusi River on 13 November and immediately prepared a dropping ground for supplies. They were accompanied by an engineer reconnaissance team headed by Major R.A.J.Thompson, and including elements from the 2/5th and 2/14th Field Companies and the 25th Field Park Company. It was a grand sight to see (and hear) George’s gaunt, lanky frame swaying and swearing across the narrow bridge. As his legs sank into the stream the troops cheered and George risked letting go with one hand to wave his red cap- this was nearly fatal but he managed to scramble his feet back to the narrow boards and reached the other side. Wairopi was not the scene of any major battles but was a key point in both the withdrawal and offensive phases of the campaign. Few who crossed the Kumusi on the flying fox or the suspension bridge are likely to forget it.